You would never guess by looking at my Pinterest boards (or my hips for that matter) that I don't really love eating sweets. My Desserts & Sweets board on Pinterest has more than double the of pins of any of my other boards. I'm always drooling over the pictures over there on Pinterest, but I think I like looking at pictures of sweet stuff more than actually eating it. Sure, I have plenty of sweets on the blog, cookies, cake, and lots of other sweet treats, but if you browse around, you'll soon find that the savory recipes here on The Two Bite Club far outweigh the sweet ones. I don't have a raging sweet tooth, but what I do have is a husband and two kids that will choose chocolate over chips any day of the week. The kids love ice cream, Oreos, candy and the hubs is partial to Ho-Hos and donuts. Nine times out of ten, I'll sit right next to them while they get their sugar fix and I'll have absolutely no desire to indulge myself. Call me crazy. I try to teach my kids that everything is okay in moderation, so I'll let them have their coveted dessert once in a while, but not every night. And occasionally I'll offer up some yogurt I stuck in the freezer or some fresh fruit for dessert instead of the stuff that is pure sugar. This momma doesn't need two kids hopped up on sugar at 8 pm, if you know what I'm sayin'. 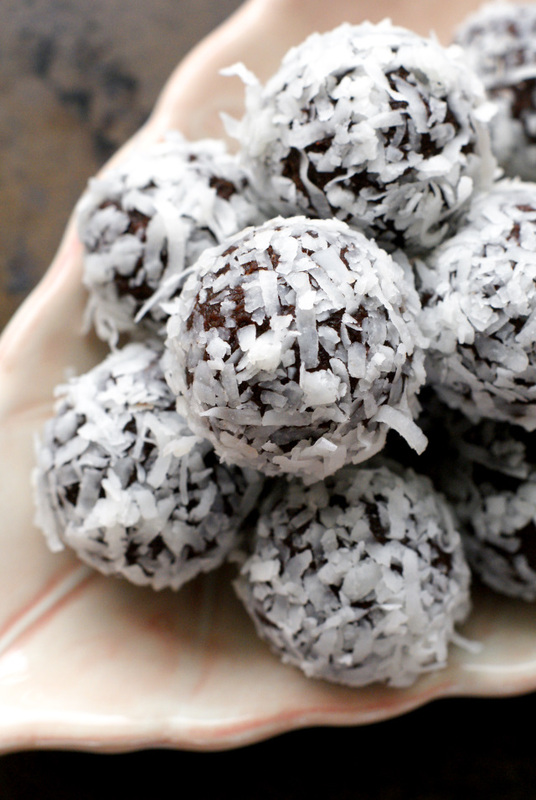 Which brings me to these delectable little balls of fudgy deliciousness. I've been making some more healthful desserts lately, in an effort to keep the sugary processed treats an occasional indulgence rather than a nightly ritual. 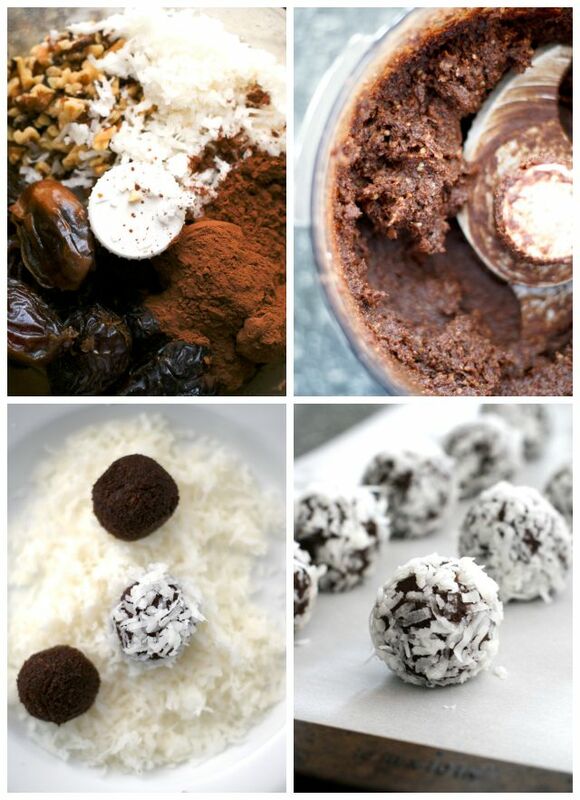 Sure, the dates that are the base of this recipe contain high amounts of natural sugars, but they are actually a low-glycemic index food and don't significantly raise blood sugar levels. Pretty fabulous if you ask me! 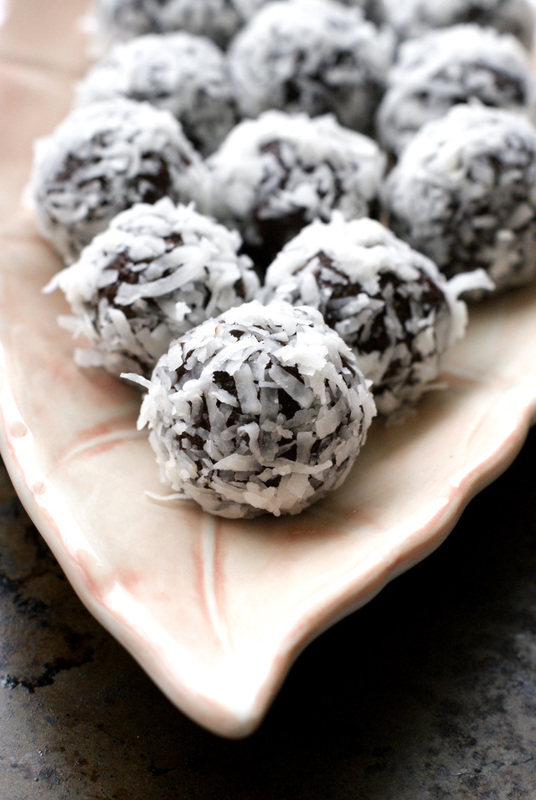 These fudge balls are made with simple, paleo-friendly ingredients, they are vegan, and they will satisfy even the most ravenous sweet tooth. Did I mention the kids approve? They do. My son is actually having a mini meltdown as we speak because he wants more of "the chocolate balls with cheese on them". Haha. When the urge hits me to have a little nibble of something sweet, I feel way better about popping one or two of these in my mouth than a 1,000 calorie sundae. 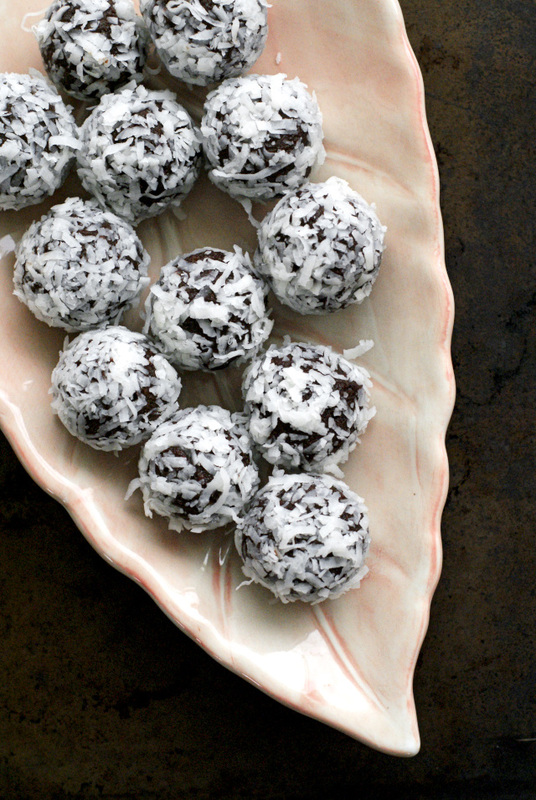 Keep them in the freezer for when your sweet tooth strikes you, too! 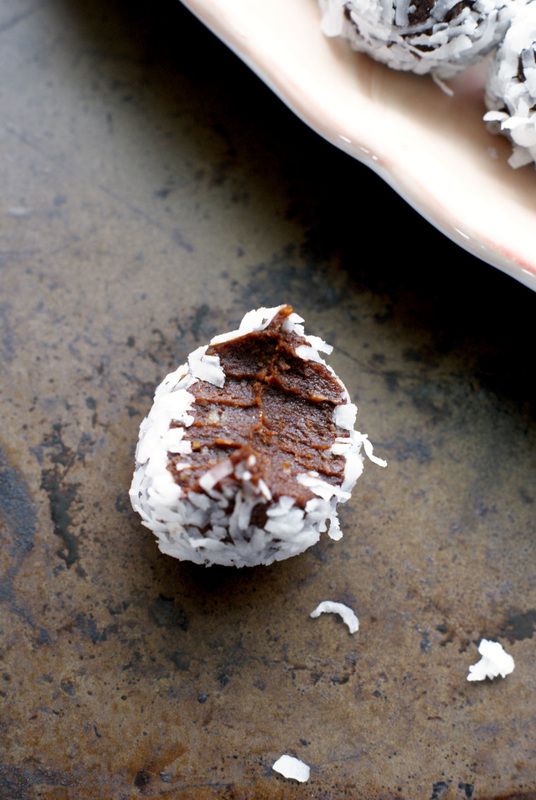 If you love delicious, chocolate and coconut desserts, you will love these!